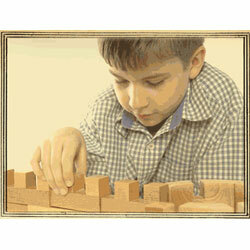 Westwork Designs was created for children who aspire to build and builders who aspire to be children again. Westwork Designs blocks aren't your ordinary dime-store blocks. Each block is carved from imported hardwood and special attention is given to the intricate details found in every piece. The only limitation is your imagination. Cathedral Blocks are the first in a series of architecturally themed building blocks created for kids (and adults) of all ages. While each series is designed around a particular building type, the unique pieces allow for many interesting creations. The only limitation is the imagination of the builder. Castle Blocks are the second in a series of architecturally themed building blocks created for kids (and adults) of all ages. This set of blocks was designed with unique castle/fortress detailing, allowing the builder to create his or her own Camelot! 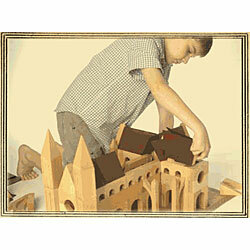 Castle Blocks come without a set of instructions, and that�s by design. Medieval Bridge Blocks and Greek Temple Blocks coming soon! We also specialize in custom-designed blocks! Please contact us for details. Westwork Design is looking for both domestic and international distributors. Click here to see some of the products WESTWORK DESIGNS has shared with ToyDirectory and TDmonthly Magazine.